ZaidLearn: Any Free Online Survey/Polling Tools? Any Free Online Survey/Polling Tools? "...There are still millions of students and educators in the Schools, Colleges and Universities around the world who are doing research, conducting surveys and spending a lot of time collecting data, providing them often with little time to analyze and reflect the findings (critical/creative thinking aspect!). 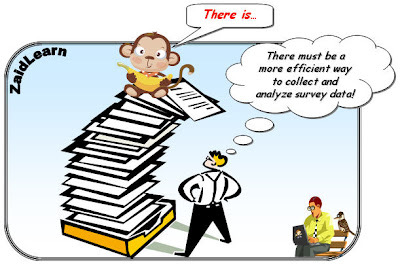 However, by providing them with a free easy-to-use online survey tool (alternative or complimentary option to their research) with basic features to create and conduct online surveys, collect the data, and display the results/reports in text and visual format (with exporting options to Excel, SPSS, etc. ), could do miracles from an educational point-of-view... (Source)"
I did once write an online letter to Google (October 12th, 2007) about our need for a free easy-to-use online survey tool, but I never got a reply. I suppose they get millions of e-mails every day, so why answer my one, unless the idea is really great (and innovative! ), or I am NEO. With the exception of Google's polling tool in Blogger, I have yet to see any innovative progress from them. Microsoft seem to be too busy with their upcoming WorldWide Telescope (WWT) (Great surf-the-galaxy tool! ), and who wants to get locked into Facebook's limited 70+ million user community doing polling and surveys (Confidentiality! Yeah, we can trust Facebook!). Yahoo? No idea! In short, the big players seem to be slow on this front, or perhaps they are planning to acquire one soon from the growing crowd of innovative online survey tools already out there. Powerful tool for creating and running web surveys (including visual reporting). The free version provides several limitations (e.g. limited number of questions and respondents), but if you are creative you can do your stuff. Anyway, the commercial version is quite affordable (if needed), so why worry! Web surveys, Polls, Forms, Quizzes, Landing Pages. Free and commercial version. Create free online surveys (e.g. market research) and polls. Excellent for polls! Makes it easy to solicit opinions & answers from your audience through free online polls. Educators can use polls as a way to stimulate conversation around a topic, encourage your students to engage with a subject, or simply lend a little spice to your lesson plans. Finally, you can easily share the personalized ProProfs polls with your audience on your website, Facebook profile, or Twitter account. Create online surveys, polls and questionnaires for any number of uses. Allows you to design free online surveys, collect responses from the visitors of your blog or website, analyze them and finally present the survey results. A free tool that enables you easily to create your own quizzes, fun surveys & tests online. An easy-to-use survey development tool that enables you easily to send surveys & questionnaires by Email, YouTube, Facebook or posted on online Forums. An easy-to-use survey authoring tool. Free accounts can publish up to 5 free online surveys. The thing I like about this tool is that there is no limit to the number of questions you can include in each survey. Also, there is no limit to the number of responses that you can gather in each survey. It offers both a free and commercial version. But I like the fact that the free version enables you to create and conduct unlimited surveys and have unlimited responses. A good open source survey tool. You need to download and install on a server. It includes +20 different question types, and basic statistical and graphical analysis with an export facility. Is a web-based tool which enables end users to autonomously create and run online surveys, feedback or registration forms (4 question types). You need to download and Install on a server. Although, it has limited tools, question types and reporting features, it is extremely easy-to-use. Create and share polls. Built upon individual polling modules called buzzbites™, BuzzDash provides a real-time forum where people can solicit, measure and share opinions on nearly any issue. Can create and share polls. If you want a more comprehensive list of survey/polling tools, mashing-up both commercial and free ones, I strongly recommend that you visit Jane Knight's amazing directory of learning tools (including 50+ survey/polling tools! Trust me, this list will grow!). Hello, my survey site Kwik Online Surveys is free and easy to use. The site is undergoing continual improvement and now includes an email feature. I believe that people will benefit from using this site. Please also consider eSurveysPro.com free survey software. Hi, I'm a high school teacher, and the module I'm teaching requires my students to conduct surveys en masse. I've been advising them to use pollograph.com for a while now. It's free and pretty easy for high schoolers to use. For your consideration. There is free online survey site, i.e Survey Face [url]http://www.surveyface.com[/url]. Here there are 14 type of question types to create a survey, and distribute survey to unlimited users. you can get a unlimited response. Hi, great post presenting various solutions. Some all of them have not been much updated lately. You forgot to mention <a href="http://www.sogosurvey.com>free survey software</a> SoGoSurvey. Very good to create surveys, polls. I have used this and my experience with this is just wonderful. There is also Interceptum an online survey application that is easy to use.